The UML standard defines an object-oriented modeling language that is supported by a range of graphical design tools. The MOF standard defines an extensible framework for defining models for metadata, and providing tools with programmatic interfaces to store and access metadata in a repository. The XMI standard allows metadata to be interchanged as streams or files with a standard format based on XML. The complete architecture offers a wide range of implementation choices to developers of tools, repositories and object frameworks. XMI in particular lowers the barrier to entry for the use of OMG metadata standards. 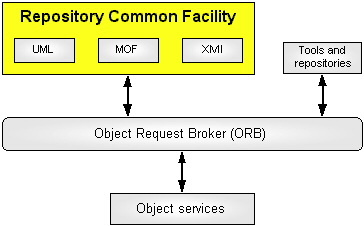 These three standards form the core of the OMG metadata repository architecture as illustrated in the following figure. The use of MOF to define and manipulate metamodels programmatically using fine grained CORBA interfaces. This approach leverages the strength of CORBA distributed object infrastructure. More information: CWM page on the OMG website.